My decision was greatly influenced by a conversation I had with my son. "What are the chances that you'll get on the show?" he asked. I answered, "I don't know, but I suspect it's very slim." 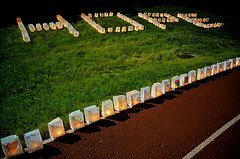 After a few seconds of silence, I continued, "I do know one thing, though. My chance of getting on the show is zero if I don't audition." He smiled. I had my answer. I ended up signing up for the fourth and final time slot, Sunday at 2 PM. As instructed, I had chosen and practiced two a cappella songs - a first and second choice - and what portions of each I would sing. I chose an outfit that I thought was appropriate and comfortable for "performer Tom," and at 1:30 PM on Sunday, I hopped into my car to drive downtown. As I turned off of my street, my car stalled. I rolled back to the curb and popped the hood (hoping to find a big on/off switch that had tripped, but no such luck). I checked my oil using some dry leaves - I'm high tech - and found it low, as was the gas. I turned the key and gratefully it started, so I headed for the neighborhood gas station. It stalled again on the way but luckily started again. Not what I'd call a good start to the audition. I made it to the gas station, added oil and gas to the car, and hoped for the best. Car troubles subsided, and I made it all the way to my parking spot downtown. (Three days and $450 later, my car regained its reliability, but that's a different story.) I walked to the Convention Center where the auditions were held only to see a line wrapped around the building. As I walked to the end, I noticed it also wound into the covered area, where the line wrapped back and forth several more times. This was the line to check in, which took about a half hour. During that time, something inspiring happened that changed the whole experience into something entirely new and fun for me. You see, after you check in, they send you over to a seating area of about 1200 chairs. I know, because I had several hours to count the rows, the chairs in each row, and the sections. This seating area was filled once, then filled about halfway again, making that roughly 1800 people auditioning, to the best of my estimating abilities (and remember, this was the fourth session of the weekend). But what was fun was that while we all waited roughly three hours in those chairs, they kept us from going stir crazy by inviting us to sing. Many people went up and sang one of their prepared songs through the bullhorn. And sometimes they asked us to sing songs as a group, which brings me to the truly inspiring part. On several occasions, I found myself singing a song with an extremely talented group of several hundred people. Sometimes in unison, sometimes call and response, sometimes in glorious four part harmonies. These weren't no-talent hacks trying to get on a TV show, these were singers. Damn good ones. The video below really doesn't do it justice - it doesn't capture the raw power of personally hearing hundreds of talented singers all belting out the national anthem in unison. But I would book this group to open the Super Bowl. Call it the "talent of the crowd," or the WikiChoir. ...which, while smaller, still had close to two hundred chairs - I was too disappointed to accurately count them. Fortunately, the wait there was much shorter, and before I knew it, ten of us were brought to stand outside of one of the ten auditioning rooms. Finally, the ten of us went inside a large room, where there were two sets of five chairs facing each other, a small piece of blue tape on the floor, and a woman at a table with a computer. We sat down, and she informed us that she would call us one by one, we'd step up to the blue tape, she'd ask a couple of questions, and then we'd sing. Sara was the third to go, I was the sixth, and Nicholas went last. (Robert went with a different group of 10 and we wished each other good luck outside before I came in.) At my turn, I went up, exchanged pleasantries, answered my questions, then proceeded to belt out, a cappella, the last bridge and chorus of Georgia On My Mind by Ray Charles, with all the heart and soul I could muster. After everyone was finished, the nice woman thanked us, informed us that none of us were chosen, and suddenly, five hours after I got in line, it was all over. We said our goodbyes and left. I went into the audition with no expectations other than the hope for an experience to remember, an adventure. I had no idea what they were precisely looking for, nor frankly did I care. I was there to sing the best I could and just be myself. If I happened to be what they were looking for, then a new adventure would begin. If not, I'd have the experience of taking a shot, and putting myself out there. I got my adventure, and I met some lovely and talented people along the way. Every single person who worked there on behalf of the show was kind and good at what they did. And I had a belief reaffirmed; that there are so many talented people out there, everywhere you go, and what a joy it is to experience. What a great story and good for you for putting it out there and giving it a shot. Reading your story reminded me of the two times I went with my daughter to the "American Idol" auditions. I wasn't the one actually singing, but just being there in those crowds of people listening to everyone sing their own songs while waiting in the looooooong lines. Long story short, she didn't make it past the first auditions either, but it was an experience to remember. And it was cool seeing some of the people we were standing in line with actually make it thru! Agreed. So you know what it's like, too! I'm still amazed by the sheer volume of talent. I love that you gave it a try. And took time to look around and appreciate the experience. Although, I'll probably never try the things I desired most in my heart, you've inspired me again to instill this way in thinking in my sons - so that they live their lives in fullness. Thanks. I love your comment, and I hope you try things you want as well! I think your actions will help instill that in your sons more than anything. Thanks for the terrific behind-the-scenes insight. Good for you for experiencing it! Tom, I am surprised you were not one of the 'chosen'! Great job taking that step to audition. And thanks for the story of your audition - sounds like a fun time. 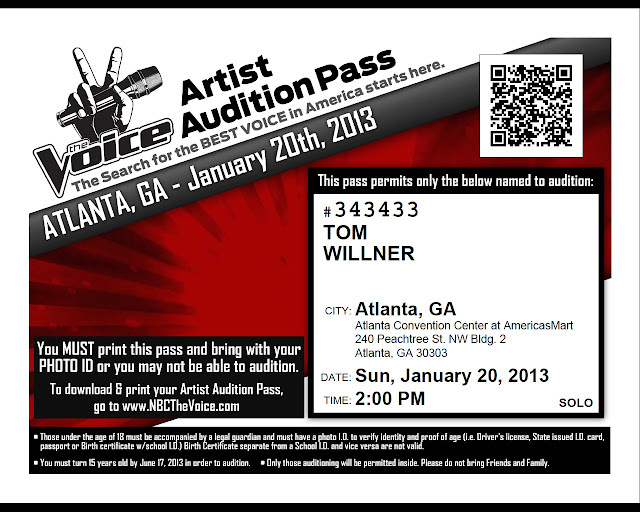 I had hoped that you would audition when I saw they were going to be in Atlanta. You should have been chosen & it would have been a blast watching you each week on Adam's team, of course! Never give up on your dream, you have an amazing talent!! Thanks for sharing the adventure!! Not only did you get a chance to share your talent and experience something new and exciting, you also got to practice patience and math :-) I'm proud of you for taking the chance! Thank You for sharing your experince,You are a amazing talented man who does have alot to give, maybe not to the voice but to the rest of the world your time will come. Thank you Lonny, that means a lot. Best of luck to you with the Cartoonist contest - I look forward to voting for you! Hi Tom! Your Voice audition confidante Sara here! How pleased I was to read your account of the day. And I share so many of your reactions to the day. Was planning to reach out to you anyway, and now I most definitely will! Hi Sara - I'm so glad you found me and commented! (I've also corrected the spelling of your name in my post.) I'm glad you enjoyed this post, and I look forward to reconnecting. Hi Tom: Thank you for your insight in to the audition process. I'm going to Vegas this weekend to audition and your story really inspired and helped me as to what the process looks like. Thank you again! I do have a question. What were the questions that they asked before they asked you to sing? and what were some of the lengths of the audition songs? any info would be greatly appreciated. Thank you! Hi Tom my name is Tamera. me and my twin sister Tia is auditioning for the voice this next year on Jan 18 at 7:00am. Do you have any advice for us, and if we make the voice what happens next? I'm auditioning this weekend. Are cameras allowed or were you sneaking some pics and video here? If I remember correctly, you could take pictures in the main area where I took them. A lot of people were. It was in the actual audition area where they didn't allow them, though it was fairly intense, so I don't recall even thinking about pictures at that time! Best of luck to you! My girlfriend just made it through the 1st auditions in philly today. Im wondering what is the average percent that gets selected? In 2012, 10,000 people in new york alone lined up for aud 1. But how many passed the 1st auddition? 100? 1000? 5000? What odds did she already beat, what is her chance to get picked in the top 25 for t.v. show time? Congratulations to your girlfriend! That's terrific news. She must be quite a singer. I wish I knew the odds, sorry. I got the impression from the audition I went to that they were very selective. From what I can gather, each city has a callback audition to reduce the first selected to a smaller number. Ultimately 250 people from all over go out to LA and audition for the producers, which I suspect is roughly 30 people from each city (8 cities, I think). These 250 are reduced down to 100. That's when the coaches begin. I've read that over 100,000 come to open auditions. Either way - BEST OF LUCK!!! I am auditioning this year in Nashville and was just wondering if you could tell me how many seconds they give you to sing? I auditioned for American Idol and they gave everyone under 10 seconds! And what kind of questions do they ask you?! Thanks for the lovely Article! Hey Megan, I actually sang a verse and a chorus, so it was probably close to a minute. Definitely NOT so short as Idol! If I remember correctly, the questions were just what is your name, where are you from, and what will you be singing today. Very simple. Best of luck to you and glad you enjoyed my post! Thank You for sharing your story Tom! I'm trying out May 14th in Cleveland Ohio. I'm a 42 year old amateur singer and you gave me a lot of great information. I'm just going to enjoy the experience. I sing Country and plan on dressing top to bottom for it, (even though I usually don't as I'm from Traverse City Michigan) but I'm going to jump into the role of cowboy and see what happens. I'm just a Karaoke singer, but what the heck it worked for Mindy McCready, well for awhile anyway. Have a great day! Good for you Kevin. Glad the post was useful, and best of luck to you! Have fun! before you sing on stage you need to sing for that woman in the large room with blue tape? and if you got in and going to sing on stage how do you make your songs instrumental/karaoke because i want to audition for the voice kids here in the philippines please tell me thank you! Hi Uen, yes, this first round tried to process a lot of people, so they just did auditions ten people at a time in a bunch of different rooms. If you get picked, and need an instrumental/karaoke version of a song, you can download one of most popular songs from here: http://www.karaoke-version.com/ Best of luck to you! My talented first cousin and his son both gave it a shot, however, with the exception of the car troubles, their story seems identical to yours. Yes the world is filled with talent for sure. I have a niece who truly has an operatic beautiful voice, is absolutely beautuful inside and out where all of these qualities stand out, yet, failed to get past the first try out for A.I. it is my guess, they are looking for more than a good voice, but a person that has an "entire show" packaged in that one presentation. Don't give up, it can only increase your chances. Break a leg. cRayZ, I believe you got it right. All the best to you, your cousin, and your niece! My advice would be: Pick a song that you (and those who support you) think really showcases your voice - the song (and a backup song) that get the best reactions from people listening to you. Then, enjoy the experience and have fun! Tom love your voice! Thanks for sharing your experience. My niece is auditioning tomorrow in NYC and I was going to go to keep her company along with her sister. Would you know if they Will they let me stay with her up until the point of the audition? (she is not a minor) Thanks in advance! Thank You Tom , for all your input . I am auditioning in Tenn. in Jan and I am SO EXCITED .. You let me know what I am in for and I can't wait to have those memories to take with me though life .. Thank You Again My Friend . 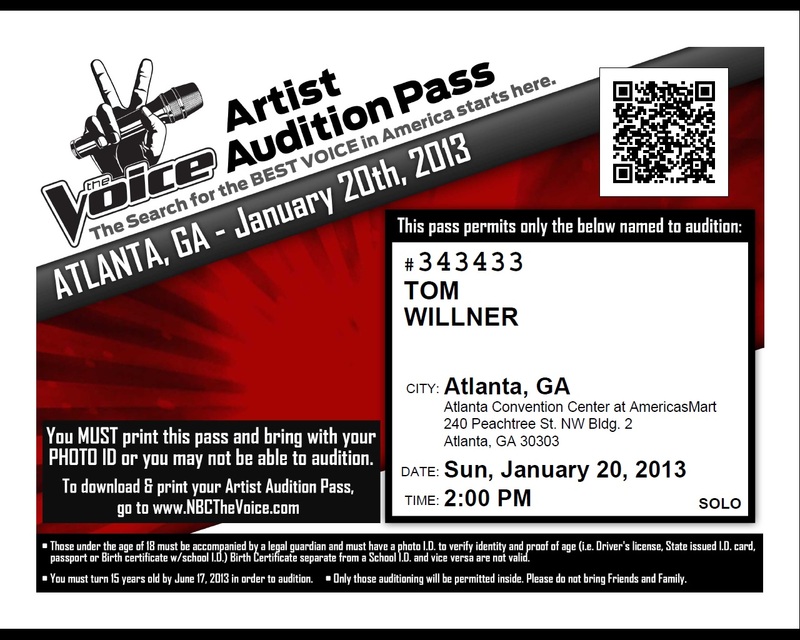 I am planning on auditioning for the voice in a few days! So nervous! What questions did they ask during the interview? Hi Tina! If I remember correctly, the questions were just what is your name, where are you from, and what will you be singing today. Very simple. Best of luck to you! Don't be nervous, just enjoy the experience and have fun - you'll do great!